In this article, I show how I was able to use my freeshell account to access google reader from the command line using elinks. The first thing I did was sign up for a freeshell account at http://sdf.lonestar.org. Next, I logged in (through telnet or ssh), and started elinks by typing "elinks". 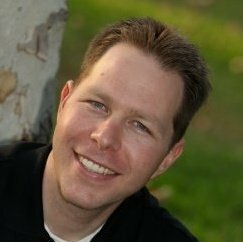 If you have a computer with elinks installed, then you don't need a freeshell account. Press the right button to move the option selector to "edit". Use the up and down arrows and the space bar to navigate to Document->Cache->Formatted Documents->number and press the space bar to edit. To open Google Reader, just press [g] and then type http://www.google.com/reader/m/tags. Log in if you are promted, but if you keep getting redirected back to the log in screen, you need to make sure the formatted documents cache is set to zero (see "Configuring Elinks"). 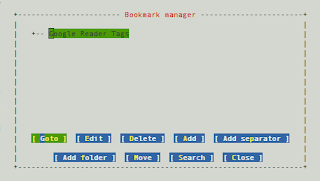 To save a bookmark of google reader in your elinks bookmarks, press [s] to open the bookmark manager. You edit bookmarks the same was as the configuration: Up and down arrows control selecting the top 1/2 of the screen, and the right and left arrows select the buttons at the bottom. Thanks, very useful to know about! Very interesting. The Document Cache settings makes all the difference in the world, but I suspect there's some more tweaks to making this sing?